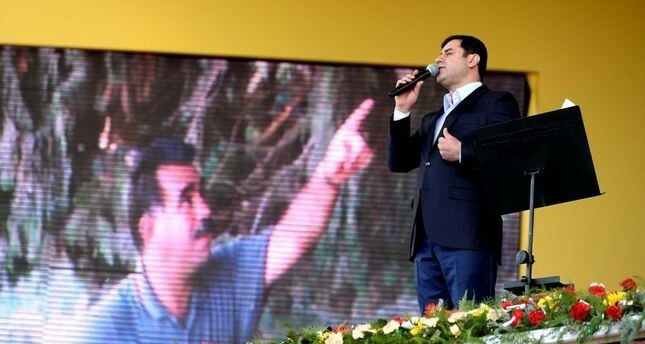 HDP Co-Chair Demirtaş speaking at a Nevruz gathering in Diyarbakır on Monday with a picture of jailed PKK leader Öcalan in the background. Pro-PKK Peoples' Democratic Party (HDP) co-chair Selahattin Demirtaş was sentenced to 5 months in prison on Tuesday by the 2nd Criminal Court of First Instance in Doğubeyazit for insulting "the Republic of Turkey, the Turkish nation, the Turkish state and state institutions." Earlier in the day, Parliament stripped HDP co-chair Figen Yüksekdağ of her status as a member of parliament over a terror sentence confirmed by the country's top appeals court. Prosecutors have sought a jail term of up to 83 years for Yüksekdağ on charges of inciting violence and propaganda in support of a terrorist organization. In November, 13 HDP lawmakers were arrested, and 10 of them – including HDP co-leaders Demirtaş and Yüksekdağ – have remained in custody pending trials on terrorism-related charges. The HDP deputies were arrested after they failed to answer a summons to testify as part of a counter-terrorism investigation. The government has accused the HDP of having links to the PKK, which is listed as a terrorist organization by Turkey, the U.S. and EU.